How to Make… Freedom Foods Crunchy Dark Choc Easter Treats! 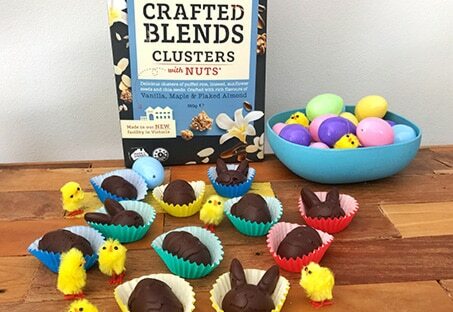 Trusted Dietician and Nutritional Advisor for Freedom Foods, Dr Joanna McMillan, has created a totally delicious Easter recipe, incorporating the Crafted Blends Clusters – Freedom Foods Crunchy Dark Choc Easter Treats. Dr Jo has used the Vanilla Maple & Flaked Almond clusters in this recipe, but you can try whichever flavour combo tingles your taste buds, such as Berries & Toasted Coconut, Pear Almond & Vanilla Bean or Pink Lady Apply & Pecan. The Crafted Blends range is packed full of fruity and luxurious flavours, which will pleasantly surprise and delight your palette. The products are all gluten free, 100% Australian made and owned, a good source of fibre, free from artificial colours and flavours and carefully crafted using a select blend of nutritious nuts and seeds. So why not go on and treat your loved ones (or just yourself!) with these delectable, but still super easy to make, treats and celebrate in style! Place the Clusters into a ziplock bag, seal and then bash gently with a rolling pin to break up the larger pieces and form a crunchy crumb. Stir the Cluster crumb through the melted chocolate. Spoon into a silicon Easter mould tray, taking care not to overfill (otherwise, the edges of your eggs and bunnies won’t be neat.) Place in the fridge for at least an hour to set. Gently tip the treats out of the mould and place in mini patty pan cases. Keep in the fridge or a cool pantry until ready to eat. Did you see our blog post earlier this year on the tasty way to reduce your risk of heart disease and cancer with Freedom Foods?